The Foundation Years art program exposes elementary level students to as many different processes as possible through activities that encourage exploration, creativity and selfexpression. The program emphasizes a skills-based approach; students are introduced to colour theory, design elements and principles of art, and become comfortable with a wide variety of media. They learn to observe and reflect and gain confidence in their ability to express themselves artistically. Students gradually develop awareness of the discipline and order of art and become increasingly independent as they prepare to enter the visual arts program at a more senior level. All students in grades 7 and 8 take dedicated visual arts courses with specialist instruction in drawing, painting, three-dimensional art, photography, graphics, textiles, ceramics, and sculpture. Additional courses include art history research, and art appreciation and criticism techniques. The emphasis at this level is on students becoming independent, focusing on the development of personal expression and style. Students planning further studies in art or design will prepare a portfolio. Our school offers Advanced Placement (AP) Studio Art. Projects in this course are customized to help students meet specific portfolio requirements for various arts schools after graduation. Project-based Information Technology (IT) courses introduce students to artworks created with a number of new media technologies. Students use a variety of tools to gather, create, edit, process and present information and ideas. In more advanced courses, students are given the option to concentrate in one of the four IT streams – Digital Communications, Media Arts, Programming or Computer Systems – or survey the streams by selecting a variety of available components. Projects are determined by the student’s independent path through course material in cooperation with the instructor. Students gaining hands-on experience using graphic and web design, editing, and post-production software, and learn to present information through print, presentation, video, audio, animation and web-based applications. Drama is a fun and engaging medium that allows students to tap into their creativity and gain confidence speaking and performing in front of an audience. Outside of class, SMS students can get involved in our spring theatre production, presented throughout Fine Arts Week each year. The spring production brings together a committed team of students with diverse skill sets who work together to take responsibility for every aspect of the performance. Focusing on theatre skills required for a drama performance. 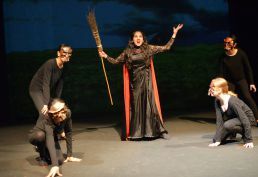 Students are introduced to theatre through improvisation. Exploring setting, relationship and plot, combining all three elements to create in-class scenes and performances for school celebrations and concerts. Exploring acting, scripted material and performance preparation, focusing on character study, the blending of set and plot and the beginnings of larger scenes. The Foundation Years music program is based on the Kodaly method – children are introduced to musical concepts beginning with experiences that are easiest for them, such as listening, singing and movement, and musical skills are developed through games, movement, songs and exercises. The Middle and Senior years programs emphasis is active participation and teamwork – students perform at school celebrations and concerts, and learn the organization and responsibilities of being part of a musical team. Students are exposed to a variety of repertoire including pop music, musical theatre and contemporary pieces. Foundation Years music: students create music using the recorder, ukulele and a variety of Orff instruments and gain experience performing as part of choir and theatre productions.. Instrumental Music: the Band Program at SMS begins in the Middle Years, where all Grade 7 and 8 students experience learning an instrument. Different styles of music are explored: traditional concert band, jazz, Latin and experimentation in jazz structures. Vocal Music: All Grade 7 and 8 students take part in choir and Grades 9-12 can choose to join Senior Concert Choir – a full year performance course that focuses on developing skills in a choral setting. A major emphasis of the program is active participation and teamwork – students perform at school celebrations and concerts, and learn the organization and responsibilities of being part of a musical team.